The Galapagos Islands are an ecological paradise with wildlife you won't find anywhere else. 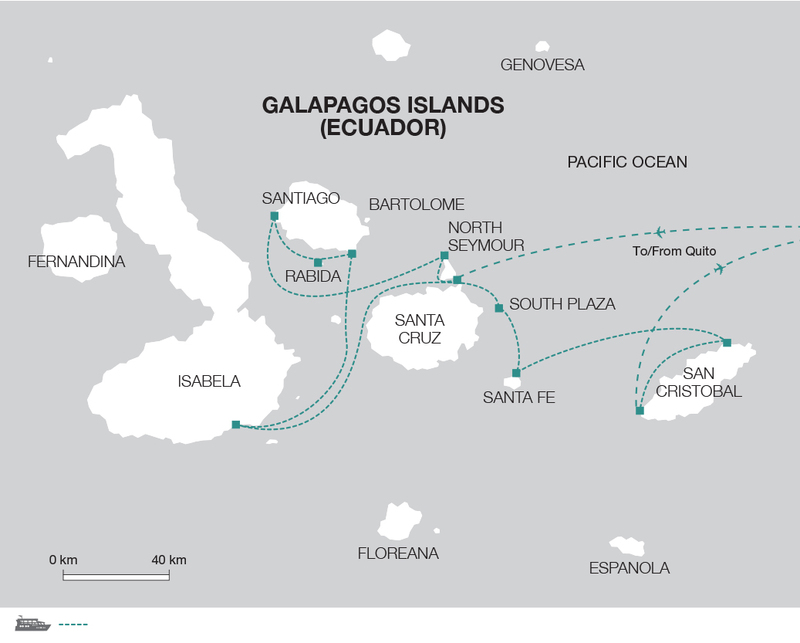 Spend seven nights on the Monserrat embarking on a Galapagos cruising adventure through the archipelago's western, central and eastern islands. Join us as we snorkel with playful sea lions, discover the unusual endemic marine life in secluded bays, visit the tortoise breeding centre on Isabela Island and hike the Sierra Negra Volcano. Please note that this tour is operated in conjunction with a local specialist company and is not exclusive to Explore customers. Your fellow passengers may come from a number of different countries although all guiding is done in English, and may include families. On arrival in Baltra, we will meet our naturalist guide and transfer to our home for the next seven nights, the Monserrat. After lunch, we will sail to Mosquera Island and walk along the beach to observe the vast sea lion colonies. Wander along the beach and keep a look out for wildlife on land, in the air, and at sea. Relax on the sand or search for aquatic life in the tidal pools that dot the coastline. Arrive at Puerto Villamil, home to the small community that lives on Isabela Island. In the morning, we will hike the Sierra Negra Volcano, considered to be the oldest volcano in the Galapagos. The volcano boasts the largest basaltic caldera in the Galapagos at an impressive 12km and dominates the southern half of the island, presenting us with some spectacular views from the top across the island and towards Santiago to the northeast. The volcano last erupted in October 2005, making it the most recent eruption of the Galapagos. In the morning the boat arrives to a small little island off the southern tip of Santiago Island called Sombrero Chino or 'Chinese Hat', named for its unique shape. Chinese Hat comprises of a tilted cone and lava flows that run down to the coast. Here it is often possible to see Galapagos penguins and the abundant marine life, including rays, turtles and sea lions, make for great snorkelling possibilities. Snorkel right from the white-coral sand beach and come face to face with playful sea lions and large schools of tropical fish. There is also a large sea lion colony here as well as many marine iguanas that can be seen on our guided walk among the volcanic scenery which offers good views to the cone of the island's volcano. In the afternoon we will take an excursion to Rabida Island, where we will land on a red sand beach. From here a short trail leads to a salt water lagoon, often home to wading flamingos. Another trail goes past the lagoon to the interior, where the revered Palo Santo trees grow. When burned, the branches of this tree give off a pleasing aroma and ward off mosquitoes. Back on the beach among low-lying bushes nest the prehistoric-looking pelicans. This is the best area for close viewing of these nesting birds, and it's a rare treat to watch parent pelicans return with gullets full of fish for the squawking youngsters. More snorkelling opportunities await - take a panga ride from the beach to a cliff wall that drops off into the water to find one of the best deep-water snorkelling spots in the islands. Today is spent on Santiago Island. This island has seen its share of human activity from whalers and pirates over the years, and despite the introduction of goats to the island many years ago, the wildlife of Santiago has flourished and provides outstanding viewing opportunities. The island boasts marine iguanas, sea lions, fur seals, land and sea turtles among others, which provide great wildlife viewing both on land and in the water. In the morning we will visit Puerto Egas to see the salt crater as well as a dark sand beach and tidal pools and the ever friendly fur seals. Grab a snorkel and jump into the water right off the beach to explore Puerto Egas' interesting underwater world. Keep your eyes peeled for rays, turtles, and reefsharks while snorkelling. After, visit the large tidal pool area - marine iguanas and Sally Lightfoot crabs are everywhere. Next, we will travel to Playa Espumilla, one of the most idyllic beaches in the Galapagos Islands, boasting thick mangroves along with flamingo and sea turtle nesting sites. Then we continue to Buccaneer Cove to witness its towering cliff wall rock formations. Spot sea lions relaxing on the beach and sea birds nesting in the cove - there's lots to see at this site. In the afternoon we arrive in Puerto Ayora, on Santa Cruz Island. Santa Cruz is the second largest island in the Galapagos and has the largest population, with Puerto Ayora as its main town. It also boasts the most varied of the islands' vegetation zones: coastal, transition, scalesia, miconia and pampa. In the afternoon we visit the highlands to look for giant land tortoises in the wild. After breakfast this morning we visit South Plaza Island. One of the smallest islands in the Galapagos, South Plaza has one of the largest populations of land iguanas. A large colony of noisy sea lions, numbering about 1000 bulls, cows and pups, has its prime habitat on the smooth rocks. We will walk along a path through a cactus forest and view a combination of dry and coastal vegetation. The small cactus forest is populated by land iguanas, which can be seen sunning themselves or feeding on opuntia pads and fruits. Swallow-tailed gulls, which nest on the rugged southern cliffs, are usually seen, along with tropicbirds and Audubon's shearwaters. During the rainy season you can see the red sesuvium turn bright green and the leafless evening-blooming portulaca burst into large yellow flowers, which are loved by the iguanas. After lunch back on board the Monserrat we will continue to Santa Fe Island. Santa Fe was formed from an uplift (rather than a volcano) giving the island a relatively flat surface rather than the typical conical shape of the other islands. Along the island's northern shore you can view the forest of giant prickly pear cactus (Opuntia). A member of the cactus family their name comes from the pear shaped fruit the plant produces. Santa Fe is also home to a number of endemic species which have bounced back from various threats to their survival. You may get a chance to see the Galapagos hawk, Galapagos snake, a variety of finches and the Galapagos mockingbird. Once back at the beach there is normally plenty of free time to take a panga ride in the lagoon to see playful sea lions and search for sea turtles, rays, and reef sharks while catching a glimpse of large schools of brightly coloured tropical fish. We land this morning at Punta Pitt, on the eastern tip of San Cristobal Island. Here we will find unique volcanic formations as well as nesting sites for all three species of the Galapagos boobies: blue footed, red footed and Nazca. Punta Pitt is also home to the endemic lava lizard. We will be able to observe a mixture of different types of lava flows as well as colourful vegetation. It is possible to see the three species of boobies as well as frigatebirds, all nesting in the same area - unique to this spot in the entire archipelago. Snorkel around Punta Pitt Island and spot schools of fish swimming below. On the shore admire the nesting birds and sun bathing sea lions. After lunch we will head to La Galapaguera, where we will have the opportunity to see giant tortoises and to enjoy a snorkelling excursion off the south-eastern coast of San Cristobal. We arrive at San Cristobal in the morning. San Cristobal is the easternmost island of the Galapagos archipelago and one of the oldest. Its principal town is Puerto Baquerizo Moreno, the capital of the Galapagos. We disembark the boat after breakfast and visit the interpretation centre where we can learn more about the Galapagos' history, geology, turbulent past and challenging future.